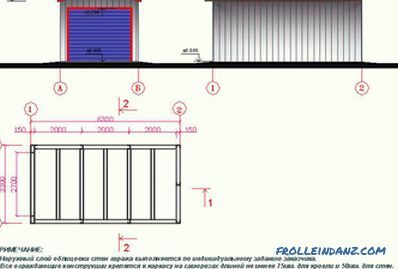 Drawing of the frame garage. find a suitable site for construction (at least 100 m²). explanatory note, which includes technical Characteristics structures, technology of its construction, a general description of the design and a list of used building materials. The scheme of the frame extension garage. From the very beginning, you need to choose a place for construction so that the car can freely leave the garage. 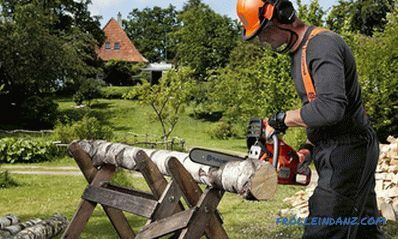 If the owner of the car of a private house has problems with the site, it will not be enough to find a place of 12 m² in size and you can proceed to the rest The territory allotted for construction is cleared of debris and plants, leveled and tamped. The marking on the site is made according to the project. Dig a ditch with a depth of 35-45 cm, where the formwork is installed on the site from three sides. The dimensions of the garage depend on the size of the car: there must be room for the installation of shelves and the movement of people. 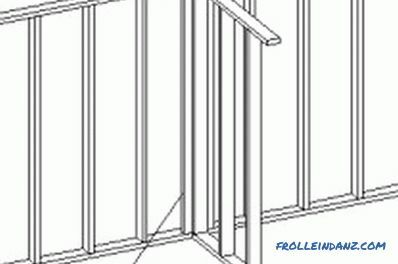 How to make a foundation for a frame construction? This type of building can be installed on a well-compacted cushion of gravel, asphalt pavement or concrete slab. The strength of the entire structure depends on the quality of the foundation. The choice of its variety depends on the overlapping scheme, the characteristics of the soil on the site and the availability of financial resources. The most commonly used concrete slab, which also serves as the floor in the garage. A trench of 35 cm depth is dug around it and formwork is put on three sides, then concrete is poured. To strengthen the foundation, stiffeners are made with 2 grids of reinforcement (Fig. 1). 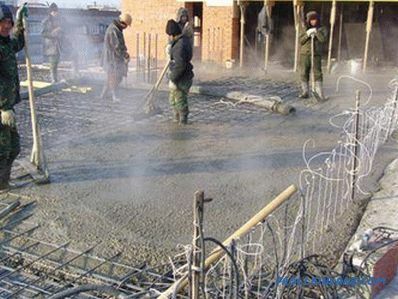 After performing the work leave the foundation for drying for 2-3 weeks. Then you need to make a base: concrete blocks (25x25x50 cm) are laid around the perimeter of the garage. This is done with a solution of cement and sand. 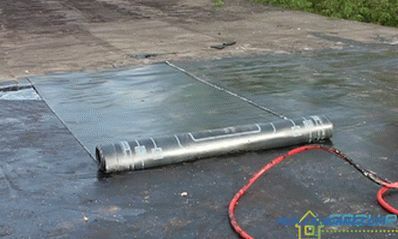 The resulting basement is covered with a waterproofing material, such as roofing felt or glass insulation. Figure 1. 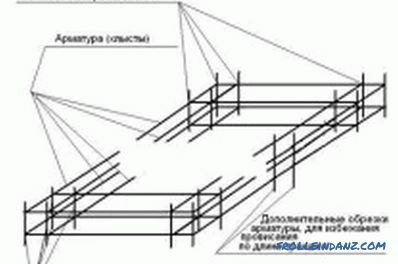 Scheme of the reinforcement of the garage foundation. For frame walls it is necessary to assemble the base - the skeleton of the garage. It is made of wood or metal (profile). Wooden beams are cheaper, but their main drawback is the possibility of fire. 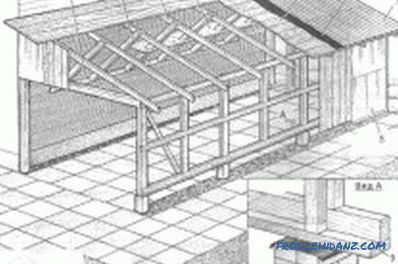 Therefore, it is best to carry out supporting structures from a metal profile, since it can be boiled or bolted, which increases the strength of the entire structure and its ability to withstand the blows of the natural elements (Fig. 2). The creation of the frame begins with the installation of the starting beam: it will be the basis for future walls. With the help of anchors that can be unclenched, the main pole is placed on the concrete base, and the fixing elements are installed in 1.2-1.6 m increments. Then, all the elements of the frame walls, racks, connecting beams, lintels and the top beam of the strapping are mounted. They are interconnected by screws with a length of 75-90 mm. Where the entrance to the garage is planned to be made, reinforcement is made so that the gate can be hung. To do this, in their openings mounted reinforced beam. If a tree is used for the frame elements, it should be treated with special compounds to eliminate rotting and protect against insects. How to sheathe the walls of a frame garage? You can use OSB-3B boards for this. Between the parts of the frame fit insulation (or blocks of foam and similar materials). 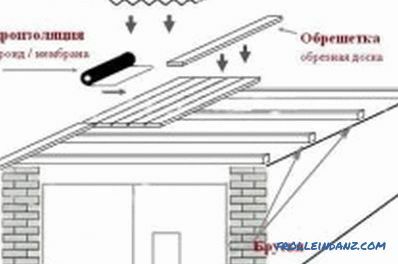 Outside, the garage is sheathed with clapboard and installed protection from the wind from vertical beams with a section of 30x30 cm of glassine. The step of their installation is 30-40 cm. 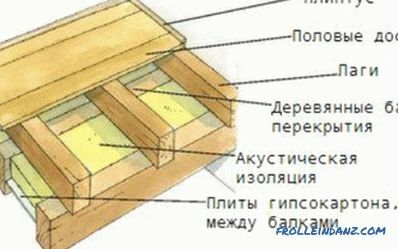 Wooden parts should be treated with antiseptic. 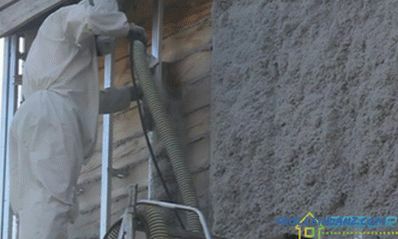 After that, the lining of the inner walls, which consists of clapboard and mineral wool, is mounted. In between the openings put double glazing, and lining done with siding. Figure 2. Scheme of the walls of the frame garage. These types of roofing are fixed with an electric drill and screws. Spillway is performed using a plastic pipe, which must be cut lengthwise. Along the perimeter of the roof they fix a snow retaining device that will protect the car from damage in the winter. If this is not done, then the snow can get off the roof and fall asleep car. Different types of doors are used for structures of this type: sliding, sectional, sliding. But with self-construction of the garage, swing gates are most often made, as they are fairly reliable, easy to manufacture and relatively easy. Usually their standard size does not exceed 2.5 m, but if the car is large, then the dimensions of the structure can be changed. To make frames for them (both internal and external) use metal squares (55-70 mm). They are united among themselves by strips of metal. A framework for sashes is made from the same profile. Outside, it must be sheathed with sheets of steel (2.5-3 mm). Gates can be made with welding or with screws. They install a homemade valve of the pipe and rod. To protect against corrosion, the entire structure should be treated with emery and covered with linseed oil, and then painted. For a garage, you need ventilation, heating and electricity systems. If possible, you can hold and water. For the exit of exhaust gases and various odors in the two opposite walls of the room, holes are made that are covered with grills. Electric convectors can be used for heat, but they consume quite a lot of electrical energy. If possible, you can carry out heating from the house, if it is located close enough to the garage. Special channels are erected on the walls of the building. They lay the wiring. The number of sockets and switches must be correctly determined at the design stage of the project. It is recommended to have natural lighting in the garage: this is done by installing windows (their dimensions are 1.1 x 0.5 m). You can make a frame garage with your own hands, if you have the skills to own the tool, the desire and the corresponding financial possibilities. A self-built structure will serve the owner for many years if all the recommendations above are taken into account.